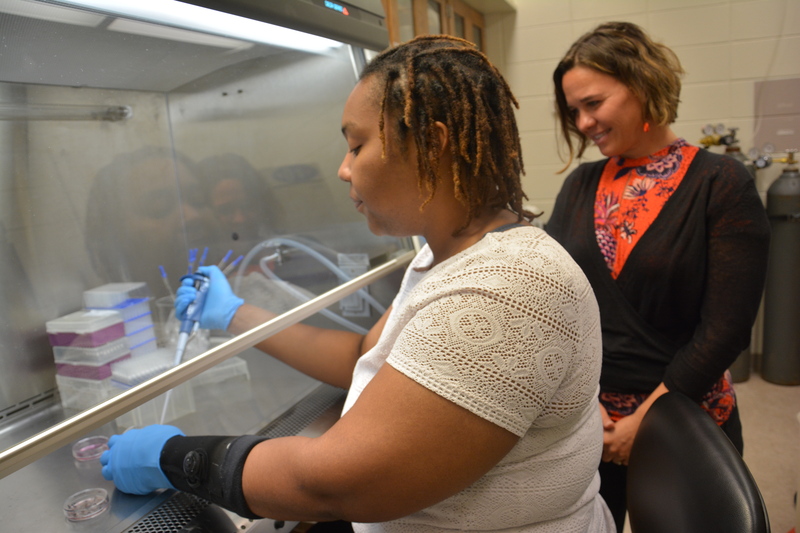 One look into Dr. Tonia Schwartz’s lab in the Department of Biology at the College of Sciences and Mathematics (COSAM), and you can see there is a lot of energy and positivity. With one postdoc, five graduate students and eight undergraduate students, Dr. Schwartz keeps busy asking many research questions that fall underneath the umbrella of how animals respond to the environment. Schwartz looks at genes and groups of genes to understand a variety of different processes involving stress response, growth, reproduction, cellular protection, and longevity. 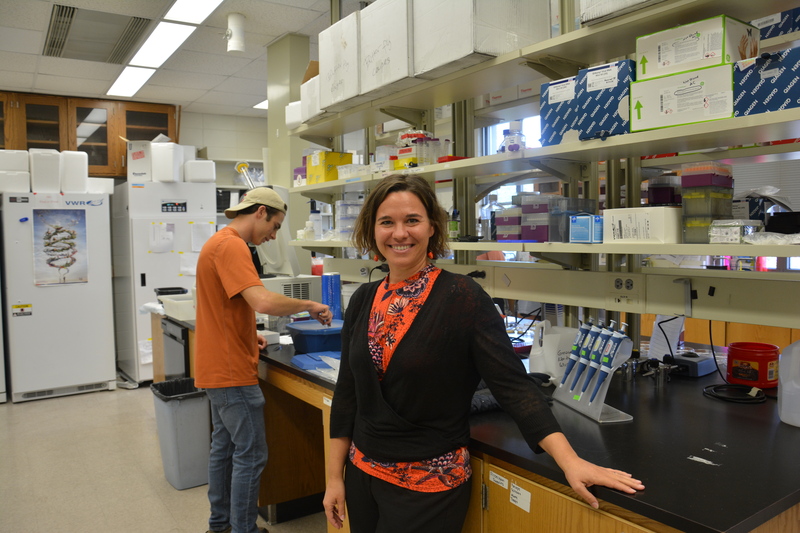 Dr. Schwartz has five major areas of research being conducted in her lab, with one studying the mitochondrial function and relationship to the nucleus. Grad student Randy Klabacka helps head these experiments and uses comparative genomics and physiology to collect data in whiptail lizards that are hybrids of two parental species. These hybrids, which have an asexual reproduction, have a mitochondrial genome that has to work with two different nuclear genomes (one from each parent species). Schwartz explains that if the nucleus and mitochondria in cells evolve at different rates and cannot work together, energy cannot be produced effectively. This research is valuable to humans as well as to lizards because we have many mitochondrial diseases and identification of mutations and genes that alter mitochondrial function can assist understanding these diseases. Another research study Dr. Schwartz is exploring involves the molecular basis for trade-offs, including lizard tail regeneration. Schwartz and graduate student Abby Beatty are studying the energy used to regrow a tail and how it could be a trade-off for the energy used for reproduction. Schwartz says that lizards are great test subjects not only because they are easy to manipulate tissue growth and body temperature, but also because reptiles and mammals are sister groups with a common ancestor so they provide interesting comparisons. By testing egg yolks, hormone levels, size of off-spring, number of eggs produced, and gene expression in different tissues they are able to see how reproduction is affected by the regeneration of tail tissues. When asked how this study could apply to humans, Dr. Schwartz compared it to wound-healing and the potential trade-offs people may face due to energy being allocated for different purposes. Dr. Schwartz urged getting involved in research when asked what advice she’d give to students. “Not only does it add a new dimension to one’s studies, but it also helps people grow when they must learn how to fail and try again,” said Dr. Schwartz. She further explains that learning how to do research is learning how knowledge is generated and since we are working at the forefront of our understanding there is not always an easy answer. Exploring Dr. Schwartz’s lab and seeing each of her students laughing and smiling showcased the friendly environment. The personal connections she creates with individuals and her desire for them to succeed makes her lab distinctive, and the valuable questions she studies make her lab highly esteemed. 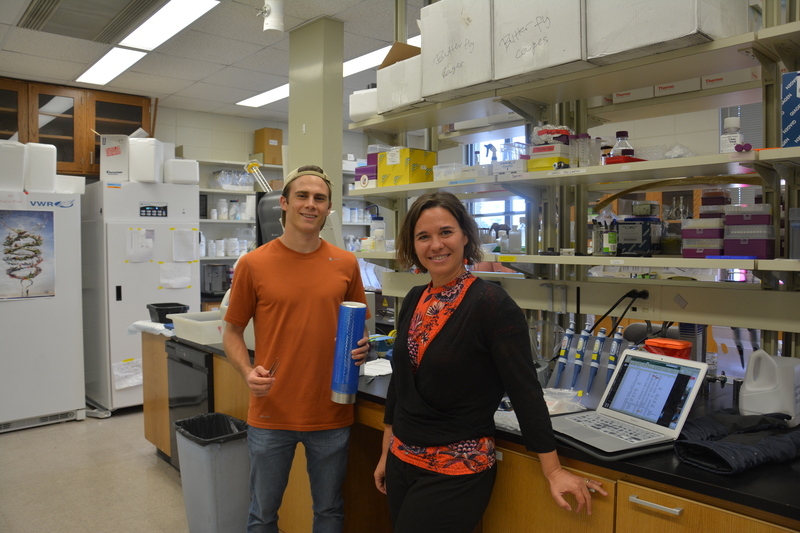 Dr. Tonia Schwartz and Randy Klabacka in the Schwartz Lab. Abby Beatty pouring agar plates for lizard gene cloning experiments with Dr. Schwartz. 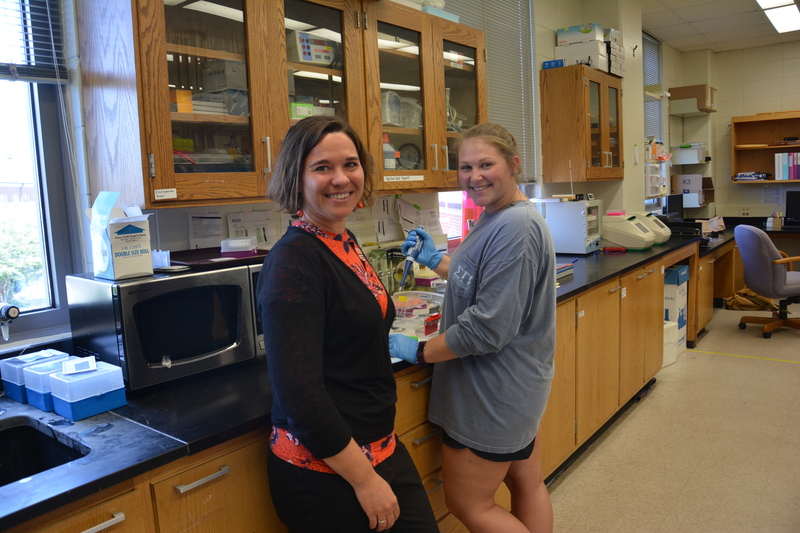 Dr. Schwartz and Devin Taylor genotyping strains of Daphnia. Amanda Clark establishing cell culture from tails of Alligator Lizard shipped to us from California with Dr. Schwartz. Randy Klabacka sorting tissue samples from Whiptail Lizards in liquid nitrogen with Dr. Schwartz.